Link roundup: June 2018 » « Niall Ferguson, queer theory, etc. The FTA is claiming that if God exists, then we have distribution B: the universe will look a very particular way, and that this matches the universe we observe. The idea is that God has intentions, and these intentions are related to the output of the universe, rather than the input. So God doesn’t particularly care how easy or hard it is to fine-tune the universe, all he cares about is that in the end, there’s life. There are several ways to poke at this argument. For instance, maybe the God hypothesis leads to predictions that are too precise, and not at all matching the universe we observe. For instance, in Christian tradition, God has perfectly moral intentions, predicting not just a world that has life, but also a world that is “good”. Since our world is not all good, this is a very narrow prediction that does not match our observations. So maybe the God hypothesis is more accurately described by distribution C.
Another possibility is that God would prefer a completely different landscape. What I mean is that maybe God would prefer a universe where life doesn’t depend on the parameters of the universe being finely-tuned. It would be a rather friendlier universe, where perhaps humans could inhabit a larger fraction of space rather than having to cling to an insignificant rock in an endless void. Alternatively perhaps God doesn’t really care whether the conditions of the universe are right for life–even if the conditions were wrong for life, God could still create life that miraculously survives anyway. The point being, that we’re very focused on just a few universal parameters like the fine structure constant, the cosmological constant, the efficiency of hydrogen fusion, but we’re ignoring all the additional parameters that God has at his disposal. Even though God’s goal is to create life, God had many options for how to do that. Our predictions, given the god hypothesis, should be distributed among these many options. We have no idea what that distribution looks like, whether it’s more like A, B, or C.
Or, instead of considering a God hypothesis informed by Christian traditions, let’s consider a more generic god. This god has the ability to create a universe, and has some sort of intentions. But what expectations can we have on the intentions of this hypothetical being that we know nothing about? There are an absurdly large number of things in this universe that have nothing to do with humans, and this god’s intentions could be related to any one of those things instead of us. After explaining how nebulous this God hypothesis is, you might expect me to say that the naturalism hypothesis is rather more mechanical and precise. But this is not the case! The FTA claims that naturalism leads to the broad probability distribution A. But this isn’t really based on any particular theory. It’s just based on a basic rule of thumb. 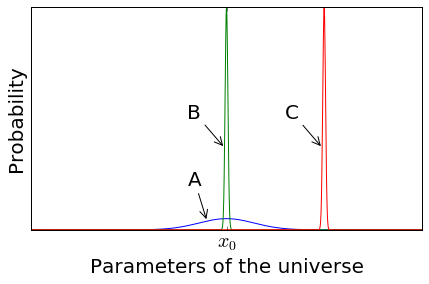 The rule of thumb is that if we’re given a parameter of the universe, the uncertainty of that parameter under naturalism is roughly equal to the value of the parameter. For example, the fine structure constant is about 1/137, so the uncertainty in the fine structure constant is about 1/137. But let’s face it, it’s not a very good rule of thumb. And to make things worse, people don’t even apply it very consistently, they mostly choose whatever rule of thumb seems most convenient to the argument at hand.1 It would be better if we had some specific theory that predicts, for example, that the fine structure constant is around 1/110 to 1/150. Or something like that. And we just don’t have a theory like that, at least not one that I know of. It’s not that it’s impossible to come up with such a theory. I’m sure that some physicists have already come up with theories of that sort, or at least tried. But it’s probably very difficult to come up with a good one, and more difficult still to achieve widespread acceptance among physicists. And even if a theory did achieve widespread acceptance, how many of us would actually understand it? Would any of us, here, talking about the FTA, understand it well enough to incorporate it into our theological arguments? Probably not. If any current theory is likely to make predictions about the fundamental constants of the universe, it’s probably string theory. So consider the image that string theory has, among the general public. First of all, no one understands it. Not many people particularly trust it. The physicists who study it regularly get accused of living in cloud cuckoo land, doing pure math that has no connection to reality. Whatever you think about string theory, we can all agree that making predictions about the constants of the universe is very difficult. We use the rule of thumb not because the rule of thumb is remotely good, but because our alternative is something like string theory. And perhaps there’s nothing wrong with tailoring your hypothesis to fit observations. I mean, that’s basically scientific reasoning. But when it comes to the naturalism hypothesis, we also have the option to tailor our hypotheses. The problem is that it’s just too hard. So from this standpoint, it’s looking a bit unfair. Theists can tailor their hypothesis, because it’s so easy that an ancient civilization has already done it for you. Naturalists can’t tailor their hypothesis, because it’s so hard that we wouldn’t understand it even if a bunch of experts already did the work, and we’d complain that the experts weren’t being scientific enough. In other words, if the god hypothesis is winning, that might be only because it has vastly lower standards. Are there multiple spacetimes, and if so, do they have different fundamental constants? Also, are the constants fundamental to our spacetime, or merely fundamental to our awareness of spacetime? Do physicist treat the terms “universe” and “spacetime” as synonyms? I can say that some physicists do treat them as synonymous when talking to uninformed louts like me. But I have also heard the phrases “local spacetime” and “other spacetimes” as well as “local universe” and “other universes”, so I assume that when I’ve encountered “spacetime” being used synonymously with “universe” it’s because context makes it obvious that the particular universe and particular spacetime that are being discussed are obviously the same one: our local one. 3. “effort” means anything to a creator at all. If either p1 or p2 isn’t true, then the debate is entirely useless. If p3 is not true, then it doesn’t matter how fine-tuned or not the universe is, because the creator-god can can make self-sustaining life in a universe where it would be very difficult to make such self-sustaining life, and the creator-god can make a universe that spontaneously generates self-sustaining life even if that universe is very difficult to create. The creator can pick from these two options at a whim and how “improbable” self-sustaining life appears to be in a particular universe with particular constants would have nothing to do with whether or not life exists in that universe. If the “probability” of life in a particular universe does not vary between universes, then fine tuning by a creator is a meaningless concept. Without a creator, there are universes where life is possible, and life exists in at least one of them, but without examining multiple universes and measuring which ones contained life at some point in their lifespans, we cannot make any probability statements about life. It may be that in very different universes, life arises only during universal gravitational collapse. In other universes life might be possible only much earlier in the universal cycle and those universes would be sterile after 13 billion years but with some having contained more intelligent species in its first two billion years than our universe has contained to date. We live in this universe. We don’t know about other universes. To sum up: It is wrong to assume that we know anything about life’s probability in universes with similar physical laws and constants. We can’t state anything about these things and thus talking about naturalistic fine tuning is incoherent. Therefore, “fine tuning” only means anything when we presuppose a creator that thinks rationally and has a finite amount of effort available for the creation of universes and life. We can only recreate an argument about fine-tuning if we assume that the creator’s rational thinking is identical to our rational thinking and that we have all information that was used by the creator when making decisions about creating universes and life. But okay, let’s say that these premises are met, and that therefore “effort” does mean something to the creator of a particular universe. In that case, you’d expect the smallest possible universe necessary to create and maintain the conditions necessary for supporting the life that the creator intends to place within it. In that case, any galaxies that did not collide with the Milky Way in the past and any galaxies that will not collide with the Milky Way at a near enough future point that life still exists in the Milky Way are entirely unnecessary. Even assuming that humans figure out a way to travel FTL, we’re still bound by the boundaries of the universe, and it doesn’t make any difference to our ability to survive that we’re limited to a universe a few million parsecs across. Yes, there’s a trillionth of the volume to explore than there would be in this universe of a few billion parsecs radius, but we’ve been confined to a volume much, much smaller than that for all of human existence and we haven’t run out of things to learn or do. Of course, one could assume that there’s intelligent life all over the universe, but we don’t know that. That’s merely an admission that p2 is unjustified. And talk about multiplying entities! So the FTA fails due to the size of the universe if our premises are met. It fails for other reasons if the premises are met. There’s not a lot of physics even relevant, except an understanding of energy/effort, an appreciation for the size and basic structure of the universe and whatever physics are minimally necessary for the person to come to an appreciation of the size and structure of the universe. Are there multiple spacetimes, and if so, do they have different fundamental constants? Nobody knows. But speculation about such things is kicked off by observing things that seem unnatural. For example, the three fundamental forces in the Standard Model (electromagnetic, weak, strong), while of quite different (but not staggeringly different) strengths at low energy, seem to converge somewhat at higher energies. So far so good. But when you compare the strength of the gravitational force to the others, it is ridiculously small (e.g. calculate the electric force between two protons separated by 1 metre, then the gravitational force). Like 10^(-30+) as strong. That seems unnatural, in the naive sense of “there are these four forces, and one is very very different from the others”. Whence the notion that perhaps we live in a peculiar universe, whence the notion that there might be an infinite number of universes with different fundamental parameters. There are other examples which Siggy has mentioned. All very hand-wavy. 1) The parameters of the universe must by necessity have particular values. (Basically, there is some physical argument that we do’t yet know why the fine structure constant MUST be 1/137.) Isn’t it odd that the parameters of the universe are precisely such that life is able to exist? 2) The parameters of the universe are random values (Basically, the fine structure constant is 1/137 by chance.) Aren’t we incredibly lucky (or isn’t it odd?) that our universe has precisely those parameters such that life is able to exist. The counter argument of course is that while life, AS WE KNOW IT, may require these exact parameters, this does not exclude the possibility that under other parametervalues something else might emerge which identifies itself as “life”. No, I would not say “universe” and “spacetime” are synonymous. “Spacetime” refers to the coordinate system we live in. “Local spacetime” refers to the neighborhood around any point in spacetime (contra Crip Dyke @2). The “universe” refers to everything that exists. It’s a bit ambiguous though… if we hypothesize that there are more things that exist than we otherwise thought, when do we explain that by saying the universe is larger than we thought, and when do we explain that by saying there’s stuff outside the universe? But let the linguists worry about that one. I feel that’s a little unfair. I mean, human behavior can be predictable, even though we know that humans are not rational according to our standards of rationality, and we know that we don’t know ALL the relevant information that they use to make their decisions. I would say the problem is we don’t know enough about God to suspect any of these premises were even in the ballpark of being correct. I’d say it’s the background of our universe, which we map with whatever coordinate systems seem most appropriate in a given context. Of course, it’s a malleable background which is distorted by the stuff (matter, radiation) on it. Like a soft tabletop. I think you’d have to explain the physicist’s argument a little bit better for me to understand what you mean. I don’t understand what’s being argued for. Regardless, in part 4, I do talk about how fine-tuning is used in physics arguments. Right, I’m struggling with finding the words to even define “spacetime”. Spacetime isn’t really the coordinate system itself, rather it’s the thing that often gets described with a coordinate system. If p3 is not true, then it doesn’t matter how fine-tuned or not the universe is, because the creator-god can can make self-sustaining life in a universe where it would be very difficult to make such self-sustaining life, and the creator-god can make a universe that spontaneously generates self-sustaining life even if that universe is very difficult to create. Yes, exactly. I raised this point in the first installment. I think it was clear enough, but there were still objections or at least confusion…. A creator-god which desires to create a universe with life in it isn’t the sort of being who needs fine-tuning for life. There’s not even a basis for supposing it would have a sort of mild predilection (far short of a “need”) toward fine-tuning for life, not to make its job easier or for some other reason that anyone’s willing/able to articulate. That kind of assumption is unmotivated and unwarranted. We don’t get it from anything in the natural world, the definition of a theistic god, the theoretical commitments or predictions of theism, or whatever else. It just comes out of nowhere, and so it isn’t evidence for theism. It isn’t, even if you want to say the case for naturalism is difficult or problematic or whatever. It would need to help you make a positive case for theism, and that’s what it fails to do. There are just theists who incoherently use the FTA, as if fine-tuning were somehow relevant to their claims. But it isn’t. What would it be like if it were? F should take up a larger chunk of the G part of your epistemic/probability space, compared to its proportion in ~G. If it’s going to count as evidence for G, then when you learn F, it had better imply G’s chances got better (i.e., more of your credence should be apportioned to G, given that you learned F). If that’s how it goes, theists would win this particular battle (if not the war) and would not merely be claiming victory for themselves. Why? Because the G side got bigger. It’s 2/3 of the whole now, when previously it was 1/2. That side had proportionally more F, compared to its negation. You could plug in a different set of values, of course, but the shift would need to be in that direction in order to be helpful for theism. They would’ve gained some ground. That is not to say that they must have started out with much, nor that they must have gained a great deal of ground – it still might not be enough to reject naturalism as irrational, all other things considered. But even if the effect is small or insufficient, it would nevertheless count as a positive contribution, not zero or negative. I don’t load up the word “evidence” with any more weight than that, and it would be evidence in that sense: even if not “conclusive,” it still counts for something. That would be clear and easily comprehensible, everybody who’s considered the matter honestly should be able to agree, and so forth. It ought to be that straightforward and uncontroversial. And I wouldn’t complain about it. The trouble is that we have no reason whatsoever to think one side (G versus ~G) should look different from the other in this respect. Have we learned that fact somehow? No, we have not: it may not be true, for all we know, and we have no business conditionalizing on facts we don’t know. Rigging it up in this way would not accurately reflect the state of our knowledge. (And note that having more universes to look at would not change anything important.) This kind of disparity was just arbitrarily presupposed, by people who wished they had a better argument than they really did. One could just as well assert that G decreased due to F or that G remains exactly the same. If we don’t have a sensible way of deciding which is correct, we don’t have empirical evidence that tells us something informative about G, just some assertions. And if that’s all you’ve got, you may as well go with the ontological argument, which ought to be just as convincing … except of course it doesn’t have that new science smell to it that gets people so excited. Sorry, I mixed up left and right here. “Spacetime” refers to the coordinate system we live in. “Local spacetime” refers to the neighborhood around any point in spacetime (contra Crip Dyke @2). Then I apologize for my error. Thanks for the correction. (1) Maybe God could create a universe that exists within a landscape that is generally friendly to life (ie a coarse-tuned universe). (2) Maybe God could create a universe that is not friendly to life, and yet has life. You are raising objection (1), while Crip Dyke is raising objection (2). They’re different. I agree with each objection in some form, which is why I mention them in the OP, but I continue to assert that the particular way you’re stating your objection doesn’t work. The trouble is that we have no reason whatsoever to think one side (G versus ~G) should look different from the other in this respect.